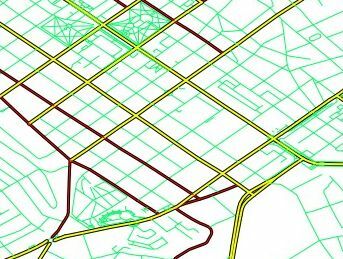 This tutorial will guide you through creating layers from your vector and raster data. To add vector data you need to upload shapefiles using Database tab. Create a vector layer in an existing node in the Layers tab. Configure classes, styles and labels. To add raster data you need to have your rasters on the server file system preferably in the "raster" folder of Giscuit. Create a raster layer in an existing node in the Layers tab. For this example we will add a Roads layer from OpenStreetMap data for Moldova (you can download OpenStreetMap data for your country here). Download the archive and extract it somewhere on your file system. Click Submit to upload your data. If errors or warnings appear then the upload process failed (notices are for informational purposes), read carefully through them and correct your data or uploading options. For more detailed information see Database. After uploading your data to the database, you can create layers from it. To create a layer go to Layers tab. Click Submit, then check Active checkbox and click Submit. This will create a container node with name "Moldova". Click Expand under Manage layers, right click on the Moldova node and select Add. Click Submit, this will redirect you to "edit" tab of this layer. Check Active checkbox and click Submit. This will create a vector layer Mdroads using the moldova_roads table in the Moldova container with a default class and style with random color. By default layer will be visible to members of the Registered role. Lets create three visual styles for Roads to get better understanding of classes and styles. First style will be applied to trunk and primary roads, second style will be for secondary and tertiary, and third one for all other types of roads. In the Layers tab under Manage layers, click Expand. Right click on Roads node and select Edit. Click on Fields tab. Select "type" field, than double click on Visibility value and set Everywhere. In order to use table fields in class expressions you need to set Visibility value of the field to Mapstyle or Everywhere. Select mdroads_default in Classes data table, then select the only available style in Styles data table. Click Submit to apply the changes. You can now see how your styles for Roads layer are rendered. For more details on vector layer options descriptions see Edit vector layer. You should copy your raster data to the Giscuit "raster". Raster data should be in one of the GDAL Raster Formats. Download sample raster data from here. Unpack and move files to "C:\ms4w\Apache\htdocs\giscuit\raster" (Microsoft Windows) or "/vaw/www/giscuit/raster" (Linux) folder. Click Submit, this will redirect you to "edit" tab of this layer. Check Active checkbox and set SRID value to 4326, then click Submit. For more details on raster layer options descriptions see Edit raster layer.